After four months of living in our boutique apartment, I think Captain Grantley and I are settling in nicely. We did have a few weeks in which Rawr, our beloved cat, was having a difficult time sleeping, and roamed around keeping us up all night, but I think that he is calming now and we’ve made ourselves a nice little home. Many of Grant’s friends were sure that I would not like cooking in a small, boutique kitchen, but I assured them that not only was I able to, but that I enjoyed it as well. It’s all about using your resources well and time management. Cooking in a petite kitchen is also helped by having the right-sized cookware. I found that a large skillet and pot were not going to fit on the tiny stove at the same time. For example, making spaghetti means using a large skillet for the sauce and the stock pot to boil the pasta. This required some magic on my part to schedule cooking times. After several mishaps and near catastrophes, I soon realized that we don’t really need to have meals that serve six to eight people. In fact, we never have dinner parties anymore, as there isn’t anywhere to seat guests, so it’s really just the two of us. Many of my friends have those beautiful ceramic covered cast iron Dutch ovens. I’ve always wanted one, but even empty they are ferociously heavy. Not to mention that a large one wouldn’t fit in my boutique kitchen well at all. Much to my joy, I found a 3.5 quart Dutch oven online and it arrived in the mail a few days ago. I am so excited! I displayed it on my stove top like my own personal Emmy or Oscar. I can see me now, holding my red ceramic pot and thanking the Culinary Academy for the opportunity to prepare a delicious meal worthy of their attention. I thanked my mother, my grandmother, my dad, God for giving me great cooking instructors and most of all, my devoted husband who has stood by me through burned food and gritty mac-n-cheese. It’s a beautiful moment. Well, it would be if it was true, but a girl can dream, right? Needless to say, I do love my little pot. It’s perfect for cooking for two. I gave serious thought to what I wanted to cook first. Taco soup, chili, or stew? No, something more robust and from the family…chicken and dumplings. A beautiful pot like this needs a beautiful dish. 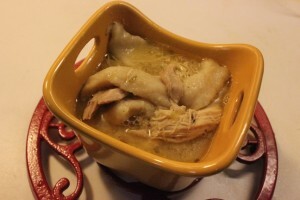 Something that harkens to home and hearth; chicken and dumplings are exactly that. They are simple, filling, and every time I have them I think of my mom and the many generations of southern women before me who made this dish for their families. Before I continue with the recipe, I want to explain what a dumpling is. In the southern vernacular it is not a biscuit sitting on top of a stew then covered to cook through and brown. That’s how many cowboys and westerners make dumplings. No, a dumpling is boiled dough. It’s thick and chewy and rich and succulent. Chicken and dumplings are stick to your ribs food and I’m so thankful my momma not only made them for me, but taught me how to make them for myself. The original recipe calls for a whole cut up chicken, 8 quarts of water, celery, onions, herbs, etc. It’s not a lot of work but it makes a lot of food. I’m in a boutique apartment, with a boutique kitchen and I now have a boutique Dutch oven. I want this dish, but not a vat of it. I wanted just enough to have two good servings plus some for leftovers for lunch the following day. I also didn’t want to take all day to make it. I made this recipe on a Wednesday evening after work and it was ready to go by 8:00. I started cooking at 6:30. I was delayed a bit because I just had to watch my new favorite show Outlander first. I did cheat and used six cups of low sodium chicken broth. This made the dish cook faster because the base flavor was already there. I am not ashamed. I wanted dumplings and I didn’t want to wait all day for them. I was hungry. Rather than using a whole chicken, I used one bone-in breast with the skin on and five chicken legs. This was the perfect amount of meat and made the stew very hearty. Now for the dumplings. I could say that I have this generations-long recipe handed down to me by mom, from her mom, and so on, and I do. It’s canned biscuits. Yes, canned biscuits. Get the cheap, regular kind. Don’t go for the buttermilk or fancy biscuits, they won’t work as well and could taste odd. The plain old biscuit in the can is perfect. You only need one can for this recipe to get a lot of dumplings. I’ve learned over the past for months that it is absolutely possible to pare down life and to cook smaller portions without giving up the big flavors. It’s almost become a game to me and I’m having a blast playing it. This week, I present a dish that is as old as time and rich in flavor: Chicken and Dumplings. I encourage you all to look at portion control in your recipes and think small servings with big flavors. It can be done. Of course having a boutique Dutch oven doesn’t hurt. A delicious southern chicken stew made easier with chicken stock and canned biscuits. Keeping it simple doesn't mean you're giving up flavor. Preheat 3.5 or 4 quart pot to medium high heat. Add oil and bring to heat. Add onions and celery and cook until almost translucent. Add garlic and cook until softened. 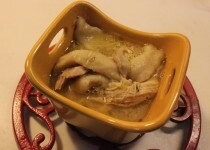 Place chicken on top of vegetables and fill pot with broth. Do not overfill. Add thyme, salt and pepper. I also added a dash of Konriko (Cajun Seasoning) to give it a little zip. Bring pot to a boil and reduce to a simmer. Let cook about 45 minutes and remove chicken to separate bowl. Let chicken stand about 15 minutes to cool and then remove from bone and place back into pot. Remove stems from thyme and taste broth for seasoning. Bring to boil again and reduce to strong simmer. Meanwhile, place biscuits on flowered surface and roll flat until ¼ inch thick. Cut into strips with sharp knife. Once all of the biscuits have been cut into strips, carefully place them in the boiling broth. Use a large spoon to push them down under the broth. They will immediately puff up and thicken. Keep adding them until all of the biscuits are in the pot. Be careful not to overfill. Cover the pot and allow the dumplings to cook for about 5 – 7 minutes until cooked through. You can cut one open to make sure it isn’t raw on the inside. Serve warm with a green salad.